$$$ Lucky Woman – An Indian Bank deposited INR 95711698647130.14 equals to CAD 1947871881507.31$ in to her account. Poor woman gets shock of her life on finding Rs 95,000 crore in her bank account! In a mysterious and unexpected incident, the UPSIDC branch of State Bank of India (SBI) in Kanpur has credited over Rs 95,000 cr into a poor woman’s bank account making her panicky. 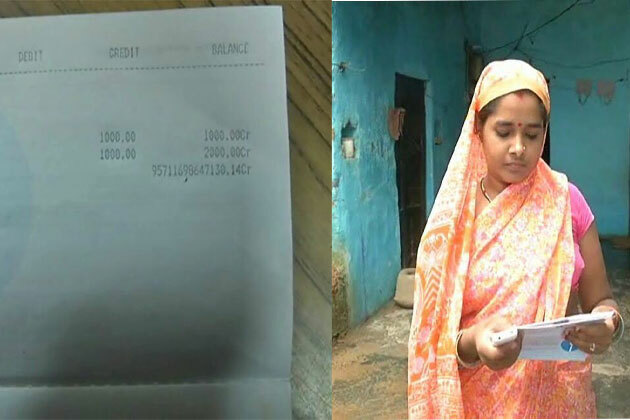 The woman Urmila Yadav got flabbergasted when she received message of Rs 9,99,990 as balance in her account, when she deposited only Rs 2000 to open her account. The amount deposited by the bank in her account was estimated to Rs 95,711,69,86,47,130.14. After this incident, she turned to her guarantor who immediately approached the bank to know about the blunder committed by the bank. And the bank’s response was surprising. The bank told the guarantor Lalta Prasad Tiwari that the woman’s bank account did not have a sufficient balance and so the bank deposited her in account a ‘fictitious’ amount. Meanwhile, Urmila Yadav, said that she does not want to court a controversy and the bank should return her original amount.